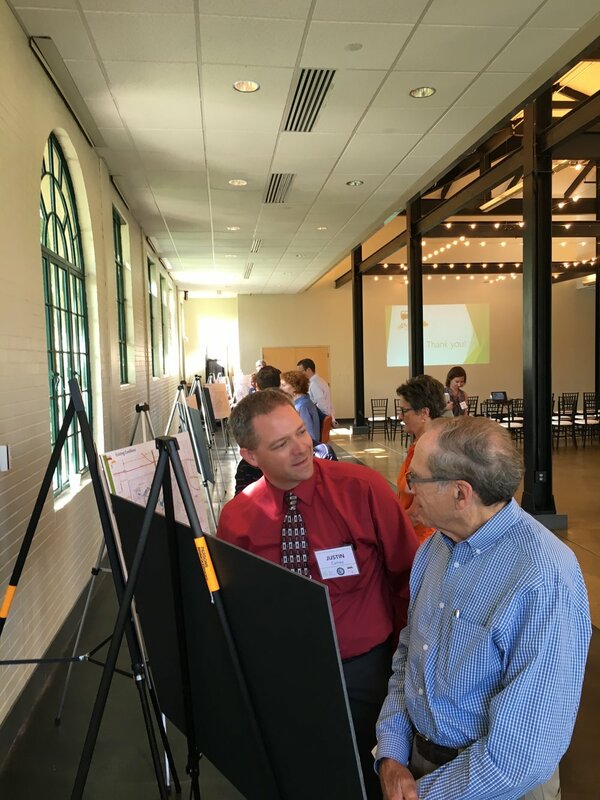 On Thursday, August 18, 2016, Forest Park Forever and the City of St. Louis hosted a public open house to discuss the findings from the Forest Park Connectivity & Mobility Study. You can read the press release for the event here. This project began back in November 2015, with a Discovery Week and public survey that resulted in more than 1,300 citizens and visitors sharing their feedback about how to improve getting in and around Forest Park. This Open House provided a great chance to report back to the community on what has been learned throughout this thorough process. Hundreds of ideas had been considered, filtering down to 22 targeted strategies for improved connectivity and mobility in Forest Park. Each of the 22 strategies was evaluated against key criteria, such as whether it aligns with the 1995 Forest Park Master Plan, what is the scale of potential impact, does it diversify the visitor experience and does it address a major public/visitor concern. We are pleased to provide an Executive Summary (PDF) of the study for community members to read. What is the purpose of the Forest Park Connectivity and Mobility Study? The purpose of the study is to take a fresh, strategic look at improving connectivity and mobility for all visitors to Forest Park. Responding to emerging technologies, shifts in societal trends, and new challenges and opportunities inside and outside of the Park, the study explores how visitors connect to and move around the Park using a variety of transportation modes. The emphasis is on identifying strategies and creating a long-term vision to enhance the overall visitor experience by improving connectivity and mobility. How does the study relate to the 1995 Forest Park Master Plan? The Forest Park Connectivity and Mobility Study is a reference document for the Department of Parks, Recreation and Forestry and Forest Park Forever to aid in understanding the relationships and considerations relevant to possible future connectivity and mobility improvements for Forest Park. The study does not supersede the 1995 Forest Park Master Plan. Future connectivity and mobility improvement projects that come before the Forest Park Advisory Board will be approved on the basis of their consistency with the Forest Park Master Plan. How does the study reflect public and stakeholder input? Public and stakeholder input was sought and received throughout the study, and has informed every phase. Issues and ideas collected during Discovery Week (November 2015) and through an online survey completed by 1,300 Park users resulted in hundreds of ideas that were consolidated into strategic objectives. Public input also helped inform the evaluation criteria that resulted in the selection of nine strategies to be further analyzed. Finally, stakeholder input helped refine each of the nine strategies through an iterative, hands-on review. Who would be responsible for paying for ideas outlined in the study? Funding for the various ideas in the study would come from numerous sources, and would depend on the type of project and who is responsible for implementation. Funding sources could include grants, private donations, direct private investment (for projects adjacent to Forest Park), or funds administered by the City of St. Louis. Funding would be identified as projects come to fruition, and no single entity would be responsible for paying for and implementing the ideas in the study. What happens with any comments received at tonight’s meeting? Comments will be collected and included in the study’s appendix. The study is a living document, to be regularly used by the Department of Parks, Recreation and Forestry and Forest Park Forever. The appendix, including comments from tonight’s meeting, will act as a technical addendum to the study, and will inform future use of the study. What is Forest Park Forever’s role in Forest Park? Founded in 1986, Forest Park Forever is a private, nonprofit conservancy that partners with the City of St. Louis and the Department of Parks, Recreation and Forestry to restore, maintain, and sustain Forest Park as one of America’s greatest urban public parks. Who do I contact if I have questions after tonight’s meeting? Questions should be directed to Stephen Schenkenberg, Strategic Communications Director, at sschenkenberg@forestparkforever.org or 314.561.3448.